With only 4 ingredients, this is probably the most simple nut free, grain free and dairy free banana bread loaf you will find. It was created at 11pm a few nights ago. We are moving house today but at the time I was busy packing up the kitchen when I spied a bunch of very ripe bananas. So, instead of heading to bed to recharge I decided to make some banana bread that Florence and every one else could enjoy. Perfect for the whole family and a completely fool-proof recipe, it is jam-packed with natural goodness and has absolutely no added sugar. The bananas add all the sweetness this loaf needs which makes it perfect for kids and babies too. It does frustrate me somewhat the amount of self labelled healthy banana bread recipes out there which have things like maple syrup added on top. Sugar + sugar = blood sugar roller coaster, diabetic or not. 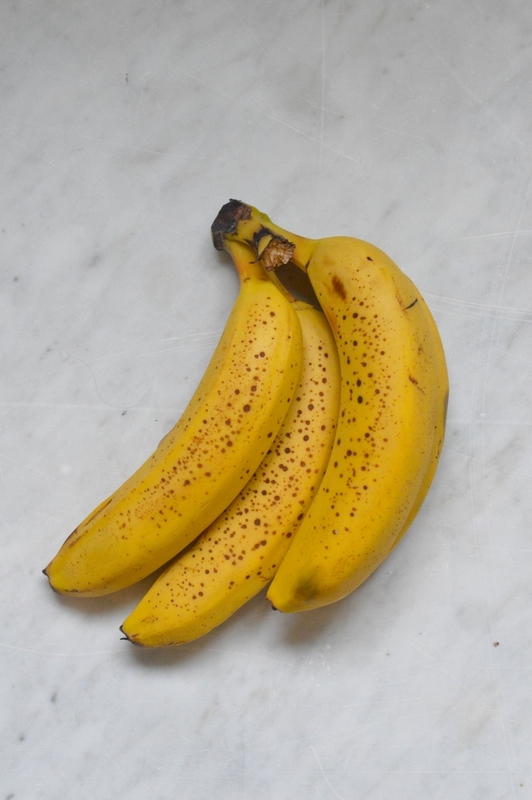 Bananas are high in natural sugars and pack more carbs per bite than other fruits (because they’re lower in water). They are also highly nutritious and a real power food but should be consumed very mindfully, especially if you are diabetic. If you are low carb then perhaps this is best avoided- I can recommend my blueberry yoghurt cake as a good alternative. There are 92g carbs in the full recipe, so if you base it on 12 slices (you could make them thinner etc), then it would be around 8g carbs PER slice. This recipe is also completely nut free. I am yet to try Florence with nuts. She has tried peanut (a legume) butter and was completely fine with it, in fact she adores it, but I still need to give her nut butter to try. The whole weaning process for me has been lovely, a really wonderful experience and Florence has enjoyed almost everything (other than tomato) and has a healthy appetite and diet full of variety. As you know, we have lived in the middle of nowhere. A down a mile long track in the forest kind of nowhere. At the time we moved here we were leaving the busy bustle of London and it seemed like the perfect sanctuary. However, being so poorly at the start of my pregnancy and then having Florence and all the dramas that followed the location has been incredibly isolating and more of a hinderance than an enjoyment. So, we are moving back to civilisation, to the beautiful regency spa town of Cheltenham. I cannot put in to words how excited I am, which probably sounds bizarre, but the idea of being able to walk Florence to the park, pop out to get food, joining a gym, meeting other mums…… will just be very refreshing and a complete novelty compared to what we are used to! So back to the nuts- I decided that it’s safer all round that I try her with nut butter when in Cheltenham. She’s not one yet and I suppose it’s just a confidence thing. Even though I am certain she’ll be fine with it, I’d just rather not be on my own in the middle of nowhere when I try her with it, just in case. That’s one of the reasons why this bread contains absolutely no nuts. I get a lot of emails from Mums who ask me for nut replacements in my recipes due to their little ones having an intolerance. Having an intolerance can carry a whole host of symptoms, with some reactions being particularly scary, especially those which can occur from nuts. So, in this recipe I have used coconut flour and it works really well. The four ingredients are banana, coconut flour, eggs and 85% dark chocolate. It’s that simple. I make it in a medium-sized loaf pan so that the loaf is about 2 inches thick but relatively long. This is perfect to control portion size but also for little hands. If you’d like it to be thicker you could use a short deep loaf pan. The loaf itself is moist and dense. It is “grain free” so it doesn’t have the same glutenous texture, but it isn’t far off. It still has spring and a beautiful, moreish texture. Anyway, I’ll leave you to it, 4 ingredients, 40 minutes bake time and about 10 minutes prep. Must dash, I’m off to move house! A 4 ingredient banana bread. 35g 85% dark chocolate, buttons if you can find them or chopped in to small pieces (you can use a lower % but just be mindful that this will increase the carb / sugar content of the loaf). Remove the skins of the bananas and pop in to a mixing bowl. Using a fork mash well until thick and creamy. Add in the eggs and whisk in to the banana mix until nice and frothy. Carefully fold in the coconut flour and add the chocolate. Once thick and smooth pour in to a greased loaf tin and bake at 180°C for 40 mins until golden and cooked through. Remove from the oven and once you can easily handle the tin, remove the loaf and allow to cool further on a wire wrack. Once fully cooled keep in a tin for up to 3 days at room temperature or in the fridge for up to 5 days. We all love this banana cake recipe in our family. It’s fantastic for avoiding cane sugar for Baby-led weaning, I even made it as a little birthday cake for my daughter, who also loves to “help” make these cakes, so long as I can keep most the banana in the bowl and out of her mouth. I will admit I don’t add the chocolate into the mix, just place one small chocolate chip on top and bake as fairy cakes or mini loaves. I also made this recipe for an older friend who has been Type 1 Diabetic for over 60years. Needless to say she loved it. She is very much of a generation that has tried baking with artificial sweeteners, with limited success and not really up to date with current food trends and the wide range of ingredients available now. She was most intrigued by coconut flour. Hi Emma, this looks great and so easy. I’m wondering about the carbs though. Do you have nutritional values for this recipe at all? Thanks.